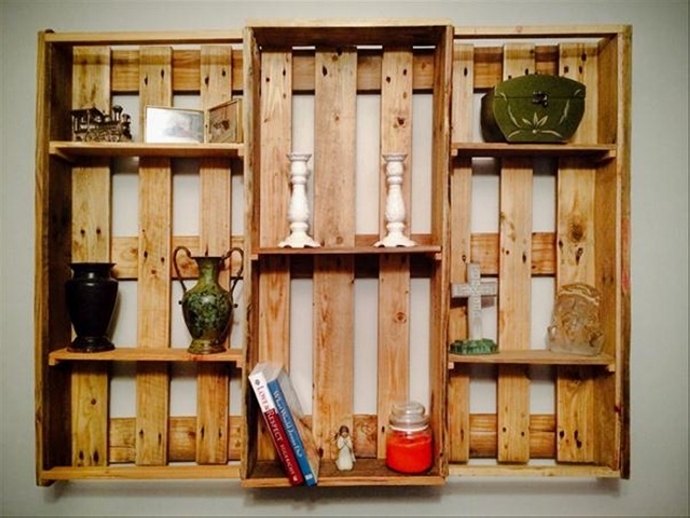 I strongly believe that the pallet wood recycling is just like a passion for many of our fellow crafters. They always seem eager to explore some new ideas of pallet wood projects and are always desperate to work on them. This recycling gives them a strange happiness and satisfaction somewhere deep inside their hearts. 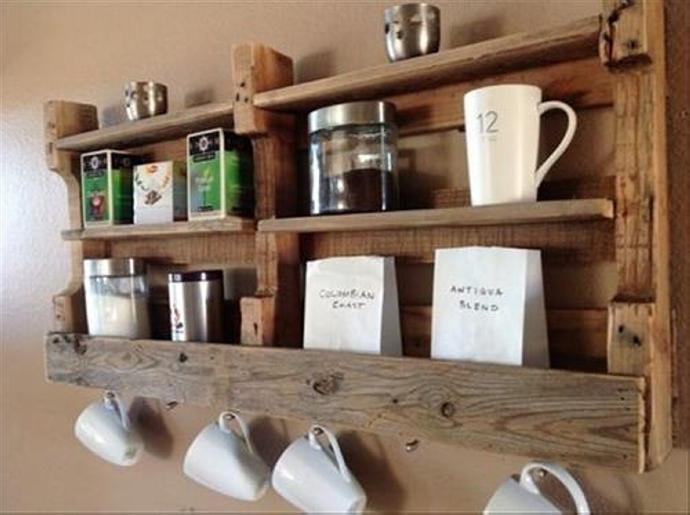 Same is the feeling for us when we come up with some more exciting and new ideas of pallet wood creations. This supports our motto of discouraging the cutting of trees as well. 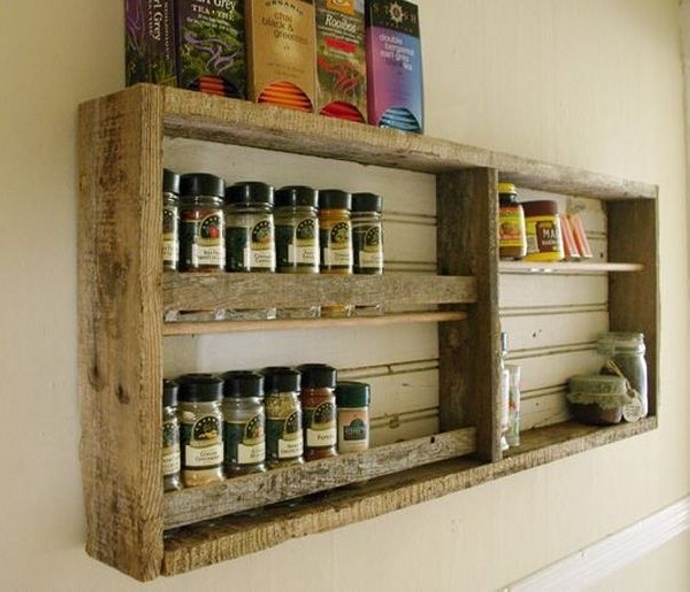 Now enjoy a whole range of decent pallet wood shelf ideas especially for your kitchen. 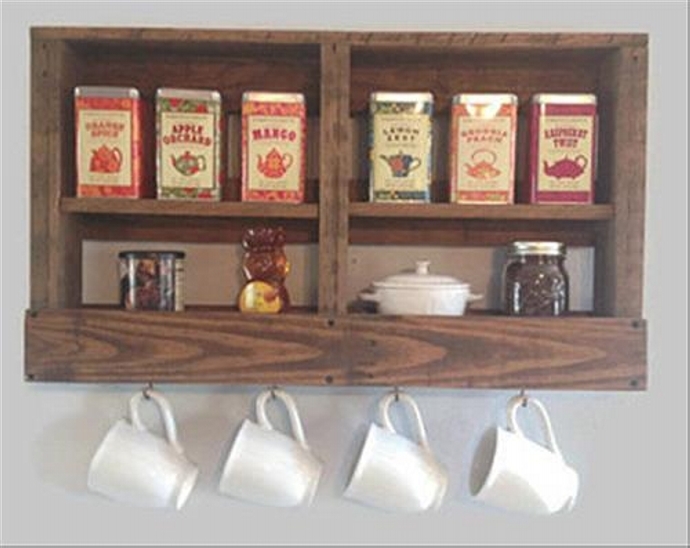 When we said about presenting some pallet shelves especially for kitchen, then we are confined to the pallet shelves that can typically add value to your kitchen. 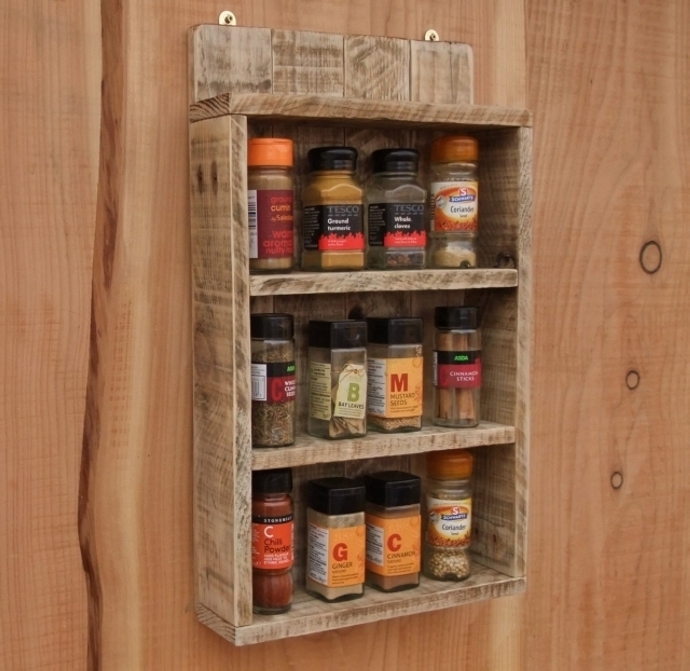 Just like this rustic wooden beauty with a lot of space for different jars of spices and other grocery items. 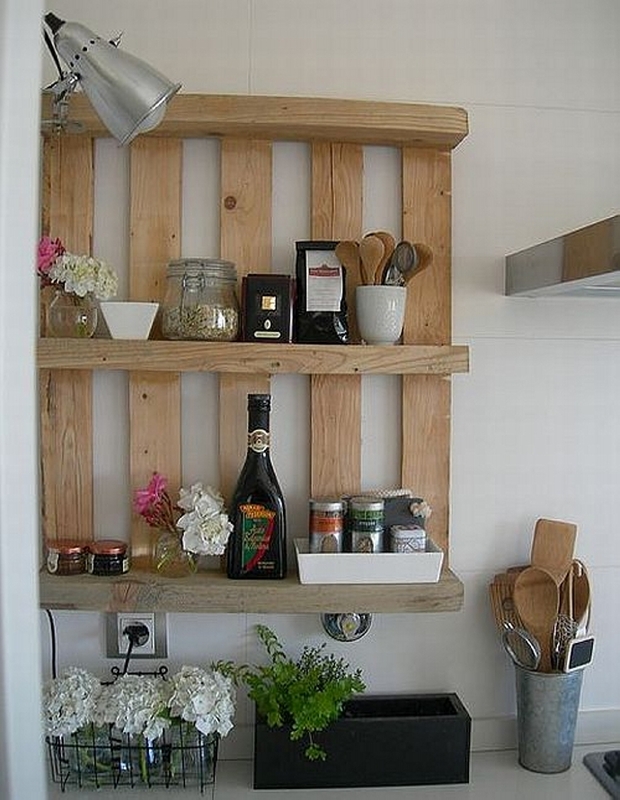 If you have a big kitchen, you can expand the wooden pallet shelves to a huge extent having sufficient workable space. 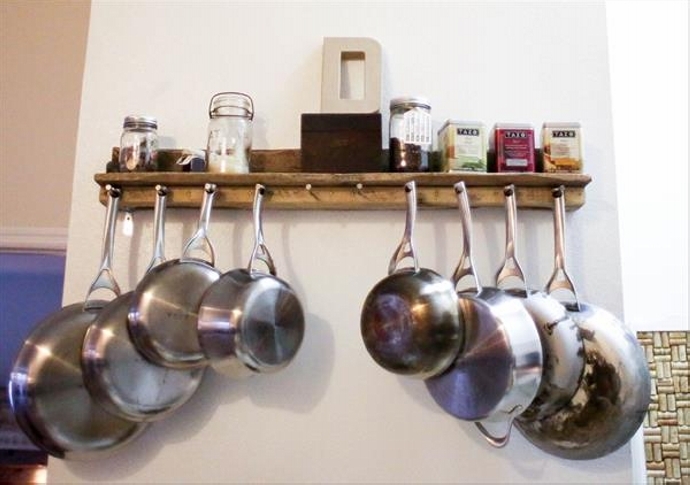 We demonstrated it perfectly here, though the roughest pallet wood planks are used here still it makes a pretty practical shelf for the kitchen where you can place a number of accessories. Putting the utensils on some proper place has always been a headache for the ladies of the house. 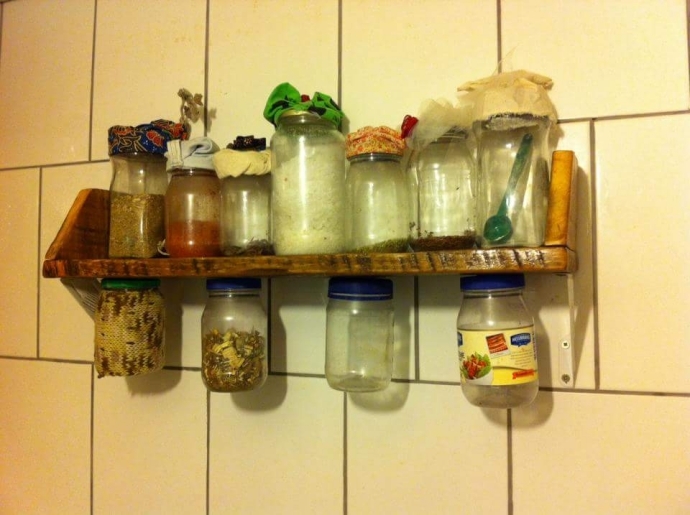 They couldn’t manage to place them along with other minor accessories or grocery items so this shelf is especially designed for larger utensils. We equipped it with heavy wooden knobs to ensure the strength. 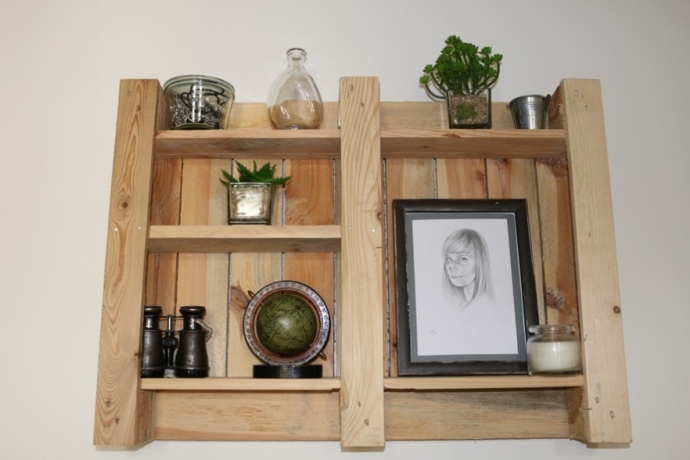 If you are still living a bachelor’s life then this sort of rough pallet wood shelves could be a part of your kitchen because the ladies wouldn’t ever compromise over the interior of their kitchen. 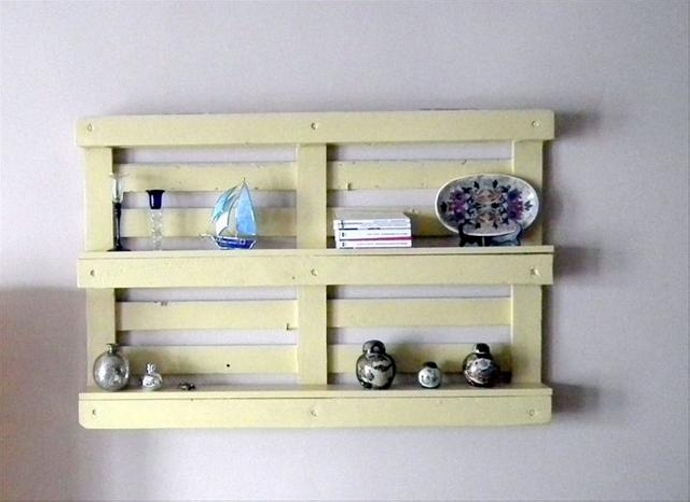 Go for a deteriorated pallet and put it to the best possible use like this. Canned foods are an integral part of our daily life. 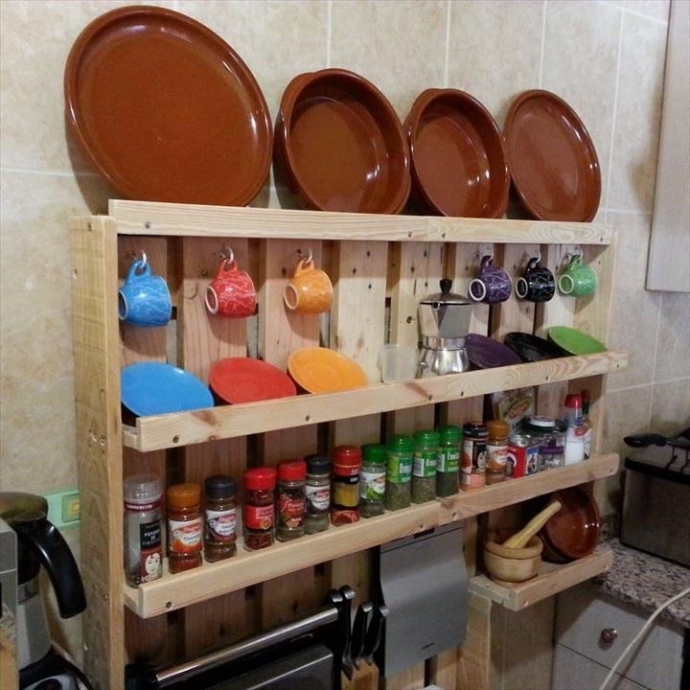 Many of the edibles come in the canned form, some of them can not be placed inside the fridge, so this would be an ideal situation for recycling this sort of multi tiered pallet wood kitchen shelf. 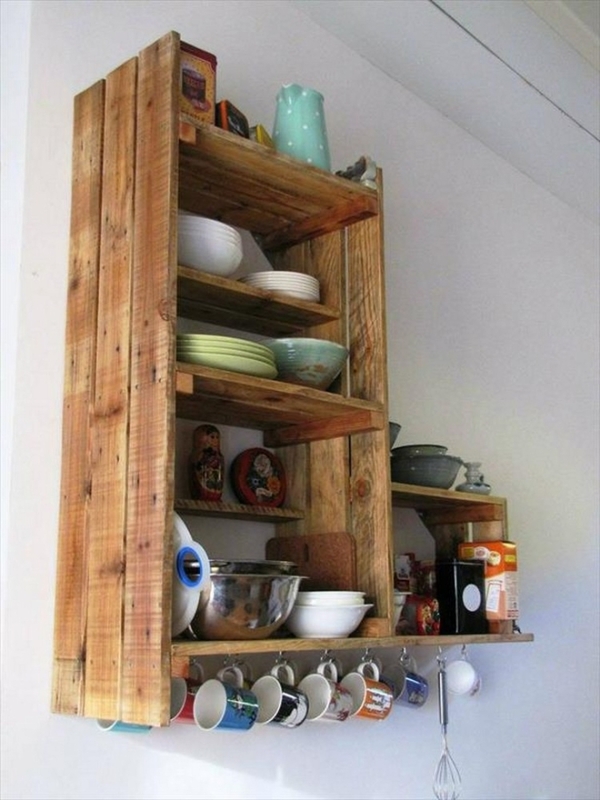 Recycling a multi tiered pallet wood shelf in a small kitchen is just like a perk or an incentive for the dwellers of the house. The issue of storage space is fixed with it pretty effectively. 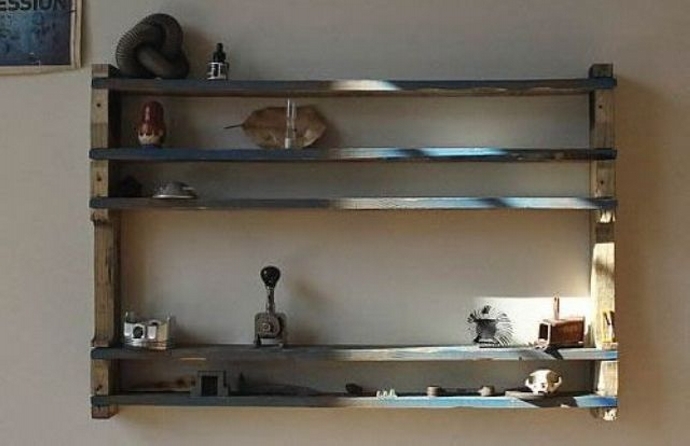 For this kind of shelves you must not bother about the condition of the shipping pallets that you have with you. Do you remember the wooden crates that we have used in multiple recycling projects? 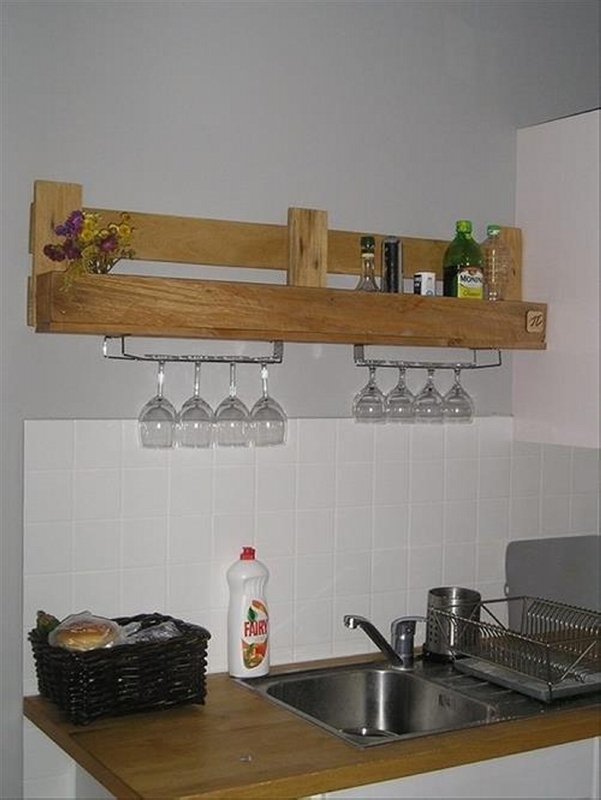 They can also be combined with the straight pallet wood planks to make a multi segmented kitchen shelf that would accommodate a large number different accessories in one single kitchen shelf. 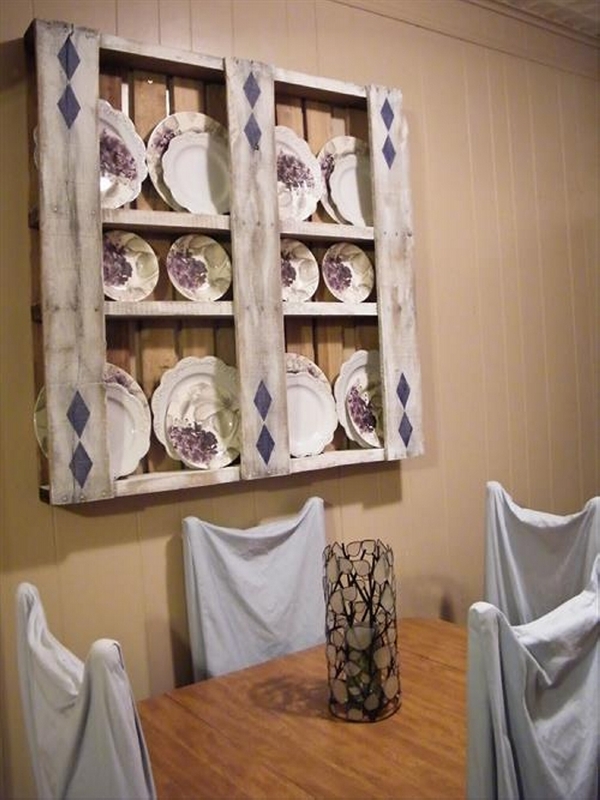 And if you are interested in giving an artistic touch to your kitchen with the shipping pallets, recycle a kitchen shelf with some decent carving on it. Keep it as simple as possible, and hang it on the wall straight away. 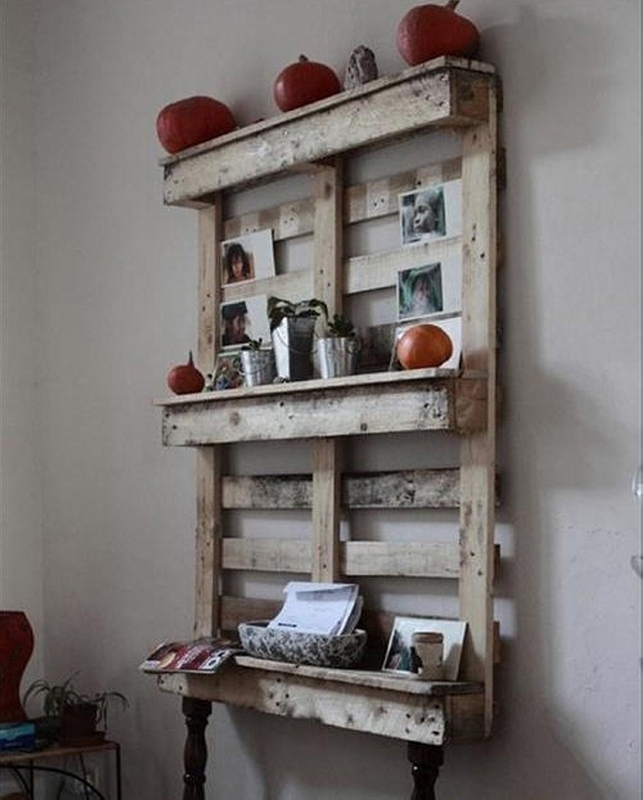 Do the partition with straight pallet planks and make the best use out of this.